Calogero Dolce first appears in the Painesville, Ohio, area about 1910. In America, Calogero Dolce was known as Charles Dolce. Calogero Dolce, son of Filippo Dolce and Rosalina Nasca, was born on December 31, 1887, at Montemaggiore Belsito, Sicily. He married Pietrina Tripi, daughter of Angelo Tripi and Carmelita Nasca, in 1920. Calogero died on September 17, 1980, at his home, 510 West Ninth Street, Hallandale, Broward County, Florida, at age 92. His body was interred at Riverside Cemetery at Painesville, Lake County, Ohio. Calogero Dolce immigrated to the United States on October 7, 1902, at age 14, travelling to Brooklyn, King County, New York. He was joining a cousin in New York. He became a citizen of the United States on July 1, 1914. Calegero resided at 601 East State Street, Painesville, Lake County, Ohio, when he was naturalized. Calogero registered for the military draft for World War One on June 5, 1917, living at 601 North State Street, Painesville, Lake County, Ohio. He was employed by Martin Kohankie Nursey. 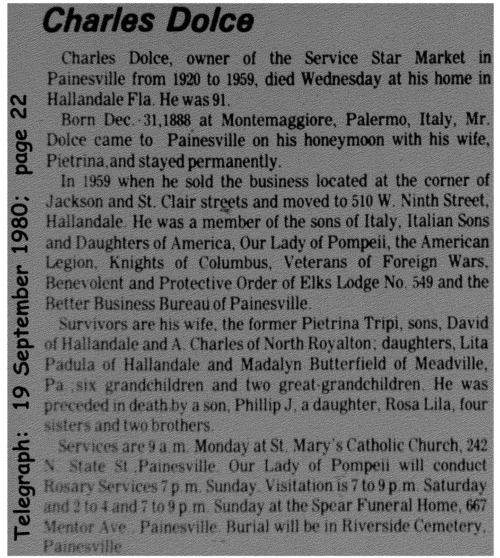 Charles Dolce, and his wife, Pietrina, owned and operated Service Star Market at the corner of Jackon Street and St. Clair Street in Painesville from 1920 to 1959. They moved to Hallandale, Florida, in 1959. 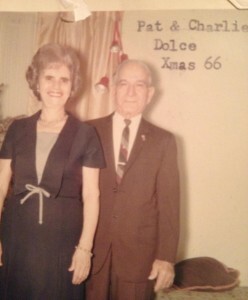 Two of Calogero Dolce’s sister also lived in Painesville. Santina Dolce and Francesca Dolce both moved to Painesville in 1913.